It’s not likely that the Hillbrook-Tall Oaks Civic Association is likely to adopt any unreasonable restrictions on dogs in the near future, although cats may have cause for concern. That’s because, according to this Washington Post article, the association’s elected president is a dog. And a visit to the association’s Facebook Page seems to confirm it. Unfortunately, the Facebook page doesn’t have any pictures of the president, who was apparently nominated when no one was willing to serve, and was elected by a rather informal raising of hands. 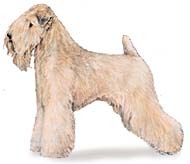 The Wheaten is a happy, steady dog and shows himself gaily with an air of self-confidence. He is alert and exhibits interest in his surroundings; exhibits less aggressiveness than is sometimes encouraged in other terriers. Major Fault–Timid or overly aggressive dogs. Thanks to Donna DiMaggio Berger for the tip!